With 2011 SP Legendary Cuts Baseball arriving in stores this week, collectors are pretty excited to see Upper Deck getting back on track with baseball releases. Sitting in the on deck circle right now is 2011 Goodwin Champions Baseball which will be out next release after Legendary Cuts and it is slated to release on June 29, 2011. 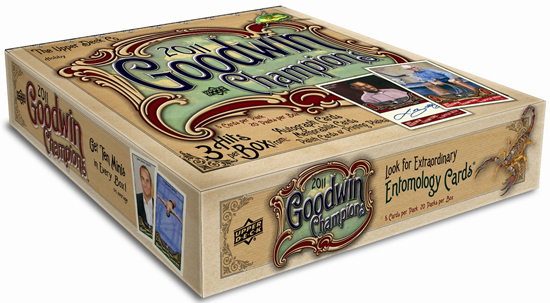 2011 Goodwin Champions Baseball is set to arrive in stores on July 5, 2011! We have been previewing exciting content from that set like the Tiger Woods hard-signed autograph cards, the Thoroughbred Hair Cuts cards and Bubba Watson’s first-ever Upper Deck trading card over the past few months. Now we want to share some exciting new content with a behind-the-scenes video with our Brand Manager for the set, Grant Sandground. Check it out! Awesome! I have almost completed the ’09 Goodwin set. Another Goodwin set building project seems like more collecting fun to me. If you guys would like a collector to bust a box on video, let me know. I would be happy to do it for you and post the results to my sportscard blog, sewingmachineguy.blogspot.com. Which reminds me… how about adding my blog to your list of hobby blogs?